Le jour où l’on met en perce un tonneau de vin de Malvoisie. English: The day when one broached a cask of Malvoisie wine. Wine is more than just a beverage in French culture, but a point of great national pride. Just as today, French wines were renowned worldwide in the nineteenth century. 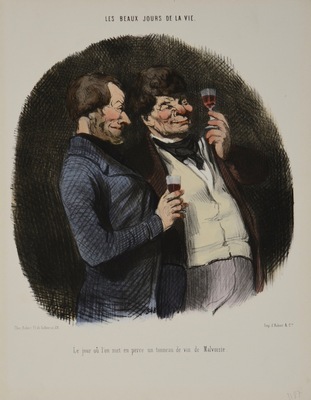 During Daumier’s lifetime, vintners prospered as the rising middle class created a flourishing market for fine wines like the Malvoisie depicted in this print—a dessert wine from the south of France.